A tractor is moved away from the scene after it lost control during the Versailles Poultry Days Parade and plunged into the crowd, injuring multiple people. 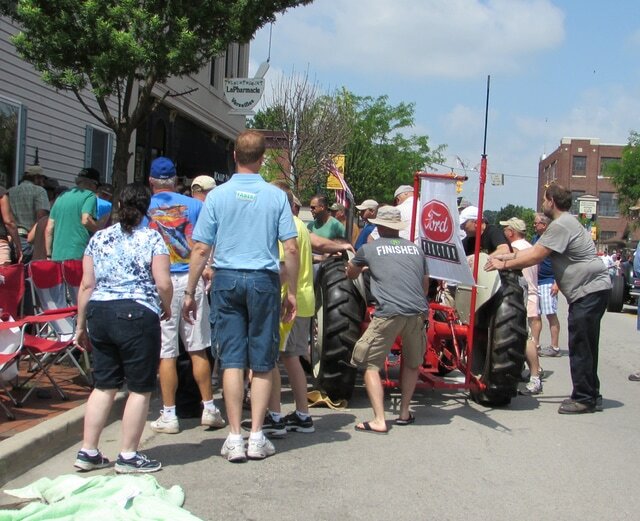 VERSAILLES — Laughter and cheers quickly turned to screaming and tears at the Versailles Poultry Days Grand Parade Saturday morning when, according to witnesses, a souped-up tractor suddenly lurched out of control and plunged into the crowd lining the streets. At least eight spectators were injured, two children and two adults were seriously injured and were airlifted. A witness on the scene reported that a man was struck by the tractor and pinned up against the building. It was not known if the driver of the tractor was injured, but he drove away from scene on the tractor in the immediate aftermath of the crash that took place in front of Fast Insurance Agency and Kaup Pharmacy. Response was swift as the parade was immediately stopped and paradegoers were told to clear the street to allow emergency vehicles — many of which had been participating in the parade and had just passed by the location — to reach the injured people.